Boomerang Bikes is not a shop we delivery to your location. Its better value for money to have groups over 12 people or hire periods of longer than 7 days. Anything less go to our Automatic Bike Hire stations. 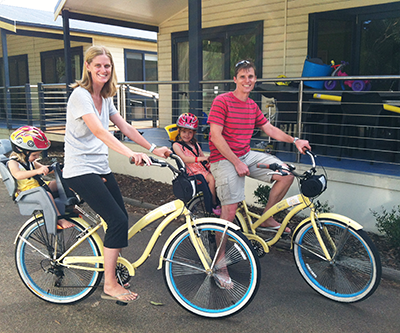 Our bikes for hire are for leisurely bike paths and roads for adults and children. Bikes for Hire include Cruisers and Mountain Bikes with or without child seats, plus a great selection of children bikes for all ages. BMX bikes for tracks or skate parks. Hiring a bike for 1 hr or 24 hrs then go to the nearest Automatic Bike Hire Station. Where do you wish to Ride or have the bikes delivered ? What many bikes do you require? Tandem bikes are great fun for large groups for team building? What is the height of each rider? Children bikes, Height? Training wheels? Remember to bring water or a drink for everyone.